Pam's six-year old granddaughter, Allie, was distressed about her cat that was stuck in a tree. This had happened once before but with a different cat. When Allie's first cat got stuck in a tree, the fire department came out to help. Unfortunately, the way they chose to help was by aiming the water from their fire hose at the cat until it fell to the ground. 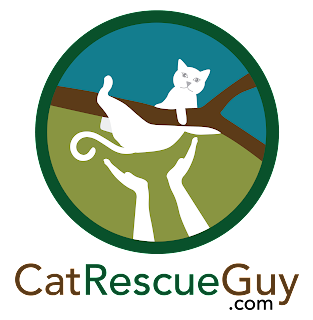 While the cat survived the fall, he suffered some severe injuries to his spine and had to be put down. Now Allie's new kitten, which she named Blackie, was stuck in a tree, and all the efforts of everyone in the family to get it down failed. Allie was worried that Blackie would suffer the same fate as her first cat, and each night when she went to bed, she cried with worry for Blackie. 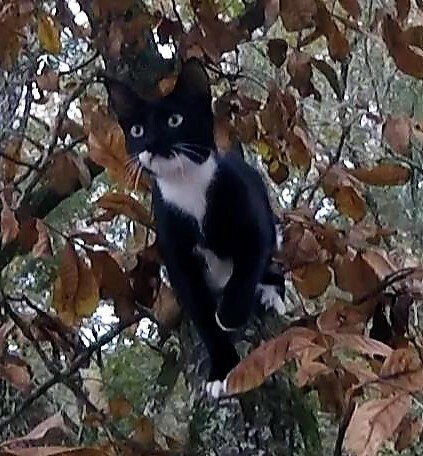 Blackie is a cute, eight-month old, black and white tuxedo cat, and for reasons unknown, she climbed up a large hickory tree next to the driveway. 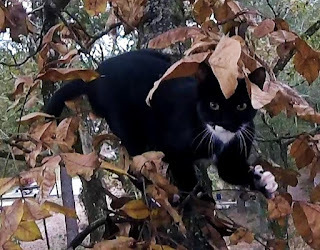 When I arrived, Blackie had been in the tree for four nights and was about 60 feet high and far out near the end of a long limb. 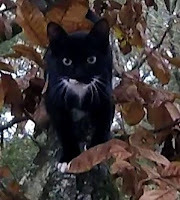 As I prepared to climb the tree, Blackie moved around the tree quite freely. She came back to the trunk of the tree, came down some, walked out to the end of other branches on the opposite side of the tree and then returned to her original place. My rope installation process distressed her slightly, but I was pretty sure that she would be friendly to me once she had time to calm down. I climbed up to where her limb reached the trunk while she watched me from a safe distance at the end of the limb. I talked to her a little, and she talked back. After only a few minutes, she decided that I was at least worth investigating further. She walked cautiously toward me but stopped when she got about five feet away. She turned around and went back a few feet because she was not yet convinced of my good intentions. After a few minutes, she came down toward me again, and this time came close enough to sniff my out-stretched hand. 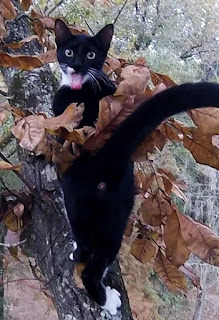 Usually, that act sets cats at ease, but Blackie seemed to sniff something troubling in my stinky glove and turned around and went back out again. When I opened a can of food, however, she quickly overlooked all my faults and came down toward me again. This time, she came close and began to eat the food I held for her in my hand. In no time, I was petting her with my other hand, and she was perfectly comfortable with that. I pulled the food away and placed it in the back of the carrier while she watched. With no hesitation, she walked all the way inside the carrier. I closed the door and brought her down. Once on the ground, I brought Blackie to Pam and then to Allie who was shy with me but, otherwise, all smiles. We all went inside and set the carrier down on the floor just inside the door. I opened the carrier, and Blackie darted out and to the back of the house to hide in her favorite hiding spot under Pam's bed. The food bowl in the carrier was empty, so Blackie had a full belly while she waited to emerge from hiding. I packed up and left happy to know that Blackie was no longer suffering in the tree, and Allie would not be crying in bed tonight.